My name is Viv Versis and I'd like to say thank you for visiting my website. I have been an animal lover for all of my life. Since a very small child, I have felt deeply connected to the animal kingdom. Animals are sentient beings with a right to love and respect from all others and it is with this philosophy that I live my life. Too many humans have the idea that we have to 'control' animals and that they exist simply to be at our disposal. This is so not the truth and animal communication helps you to understand this. I have supported a large number of animal charities throughout my life and still do on a regular basis. All my own animals have come from rescue centres and in the last decade or so, as circumstances have dictated, all my furry friends have been felines. For some years my husband and I took on elderly and sickly cats that were overlooked at the rescue centres, ones that no-one seemed to want. We couldn't bear the thought of these beautiful souls ending their days in a cage somewhere without the tender and loving care that they deserve and home comforts we would expect our own animals to have. However, our hearts were broken every time we had to say goodbye after only a short time, due to their ill health. It was so hard to do this time and time again. We then got to the stage where we decided to give heartache a break for a while and to take on a younger cat. So in 2005, through Cat Protection, Sophie came into our lives as a young female of about 9 months. She was rescued from a house with 16 others cats, very timid and frightened, but desperate for affection. It has taken a very long time to gain her trust but we've got there. She is definitely not normally a lap cat but one day, for a beautiful moment, she decided to sit on my lap for a very short time. We had to capture this momentous occasion and this is why it is at the top of this page! Our lives revolve around her needs and welfare - totally pampered, and I wouldn't have it any other way. Through yearning to communicate with animals, my path led me to James French who is an internationally recognised Animal Communicator and Healer (see my links page for further information). James' approach is inspiring and he has helped many many animals, both wild and domesticated, to attain a happier life by showing their human companions how to 'connect' and to help an understanding between all parties. I attended a workshop as an introduction to this skill and then through his personal guidance, I qualified as a Professional Animal Communicator. This entailed having to complete at least 10 case studies followed by 4 professional assessments taken with experts in Animal Welfare, Animal Behaviour, Animal Training and a Veterinarian. I averaged a score of 96% overall. I am incredibly sensitive to the suffering of other species and have been interested in the care and healing of both humans and animals for a very long time. I am certified in Basic Veterinary Homoeopathy, studied Advanced Animal Care at Lackham Agricultural College, am a Reiki Practitioner (encompassing Spiritual Healing) besides being a qualified Animal Communicator. Walking this pathway, and to be able to help both humans and animals achieve a happy life together, is the most fulfilling thing I have ever done. I deeply care about all sentient beings and look forward to helping you in any way I can. Contact me by telephone 07850 229567 or by email: serendipity4animals@gmail.com. (Please note I am fully insured through Balens Specialist Insurance Brokers). 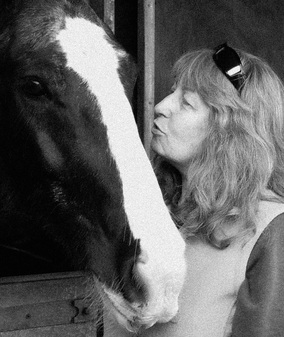 Me with the wonderful Oliver, a friend's horse that I visit as often as I can to get my 'equine fix'!